I must confess to having no clue what is in the second image. 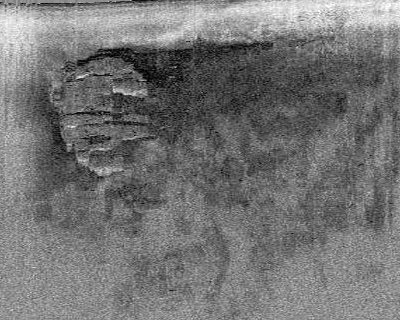 As far as I can tell bright areas in the images represent areas of high sonar reflectivity (although certain statements on the OceanExplorer.se website would tend to contradict this), so the dark patches in the second image could be any sort of slightly rougher or softer surface, perhaps communities of some sessile organism, or simply the backside of a dune. The area in the upper right corner is the “UFO.” Since this area was also most heavily damaged by the linear noise mentioned in my first post, it’s quite possible the noise is tricking people into seeing what isn’t there. I still maintain the circular image in the first image is a sunken surface, not a raised object. 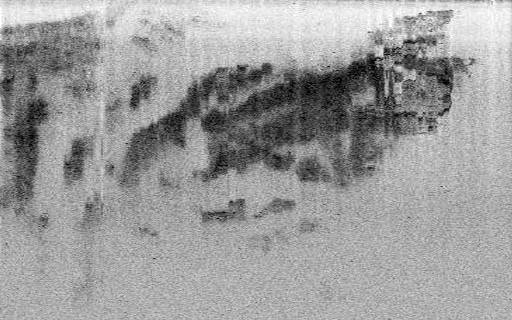 I’m apparently quite alone on this, but I’ve compared the sonar images with others from the same website, and these still appear to me to be “positive” images (bright = high sonar return), albeit with greater return than normal from the ocean floor (perhaps the gain was set too high). In my interpretation, the linear features within the circular area are raised objects, not channels or chasms. I don’t know if they were a load of iron beams dumped by a ship in a storm or if they are simply the raised edges of bedrock layers or something else (there’s been mention of volcanic vents), but their presence has caused a water current that tends to flow in the same direction to scour out the sand or mud around them, forming a circular depression. This same water flow combined with eddies from the circular area is also responsible for carving the dark cliff face, visible across the top of the image, from the side of a long dune. But soon we will know, right? Good luck to the Ocean Explorer team, whatever they may find.